I’m a relatively fast reader. When I put my mind to it, I can get through an entire novel in a day or two, sometimes one sitting if it’s a shorter kid’s book. Unsurprisingly, I often fly through graphic novels with their low word count (a Shonen Jump volume takes me minutes, max). But sometimes I wonder, am I reading my comics too fast? When get immersed in a graphic novel, I flip through the pages, anxious to see where the writer/artist is taking me. But in my hurry to find the story, I also find that I sometimes miss out on the art. When Mark Siegel visited Lesley last residency, he mentioned (and I’m paraphrasing here, sorry ’bout that) that one reason some people may not enjoy graphic novels is that they don’t know how to read them, because they forget to read the pictures. While I don’t have that big of a problem (I would have stopped reading comics a decade ago if that were the case) my brain seems to shift the images to a second priority over the words, and if I’m in a hurry to find out what happens next, they are an easy thing to skim over. However, I’ve noticed a difference when I read single page releases of comics (or webcomics). They slow me down. Assuming I’m all caught up with the story, after I read the latest installment of a story there’s no new page to turn. So, in order to prolong my enjoyment while I wait for the next posting, I wind up taking a longer look to get what I can out of the page. 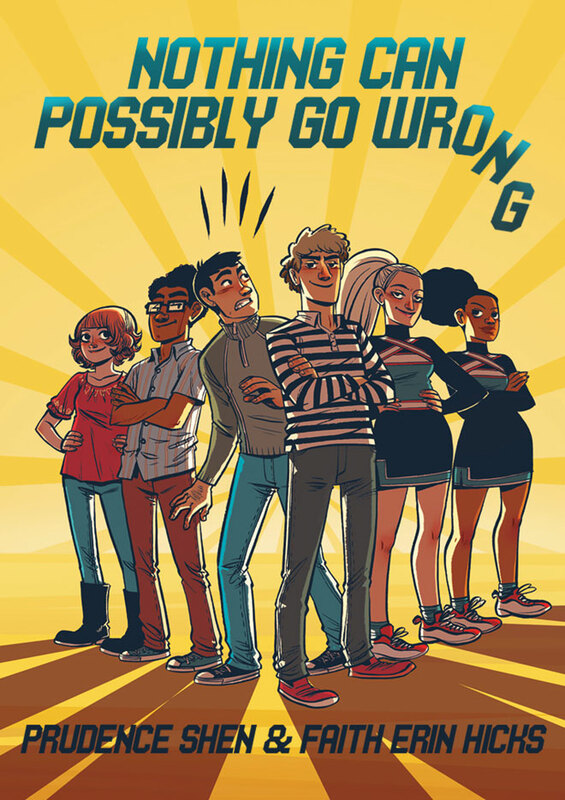 I figured this out while I was reading Prudence Shen and Faith Erin Hicks’s comic, Nothing Can Possibly Go Wrong, which is being serialized online until the book is released. Once I caught up with the story and ran out of “NEXT” buttons to click I started taking my time with the page, spending longer moments on each character, action, and sound effect in addition to the dialogue. I was carefully “reading” the art, and I loved the comic so much more. I don’t just need the slow delegation of comic pages to become a more conscious reader; sometimes the comic itself helps me with that. When the story gets frenetic and the dialogue is flowing it’s just too easy to flip through the pages too fast. Then there are times when the artist takes control and slows down my reading pace without my even noticing. Going back to Faith Erin Hicks again (I love her), I noticed in her other graphic novel Friends with Boys that she had a lot of silent panels, where there’s no narration or dialogue to tell me what people are thinking or feeling. Instead, it’s all in their expressions and wordless actions, so if I really want to understand I have to pay attention. My favorite example is in a really fantastic scene when the main character’s father is trying to comfort her about her mother skipping town. He reaches to put a hand on her head, and without speaking or looking at him she pushes it away. That gave me a lot more about her comfortless pain than any dialogue could. Then there’s Cross Game by Mitsuru Adachi. 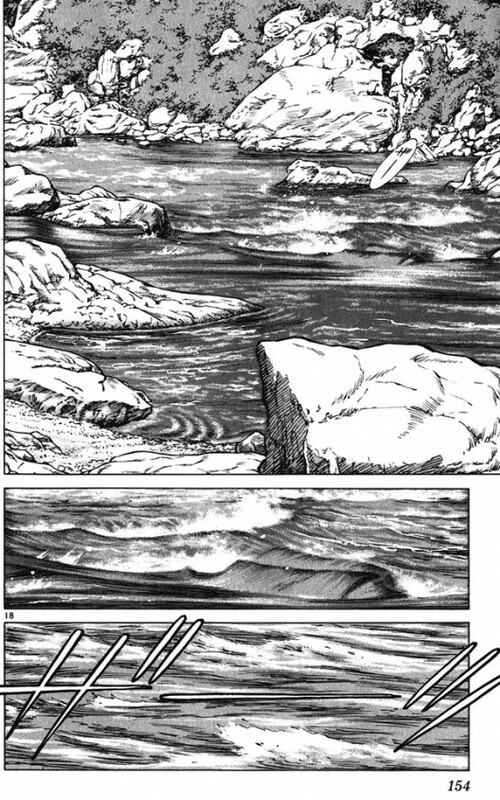 The story is already told at a deliberate pace, but Adachi also practically forces you to pause with panels of intricately detailed scenery (something Scott McCloud calls an “Aspect-to-aspect transition”) which settles you in the place, but also sets up the mood of calm or anticipation. Instances like that certainly cause me take a moment and drink in the art. Still, it shouldn’t be completely up to the artist to make me slow down and pay attention. The more I’m aware that I do this, the more I’ll take the time to really read the comic, which, I think, will give me an even better reading experience. Do you read comics too fast, or are you one of those that has trouble reading them? What are some good uses of silence that you’ve seen in graphic novels? Your article speaks the truth. I realised too some years ago that I was reading comics too fast. I was reading a One Piece volume (which as you say only takes minutes to plow through if you read fast enough) when I realised how much One Piece I have read without really looking at the art. As you said, the compulsion to see where the story goes is often why we only glance at the art and focus on the words. Once you become aware of that, it’s a new reading experience that is offered to you, because if you make the decision to take your time reading, you start noticing the craft that the artist put in telling its story in the comics format which is very, very intersting to observe. Of course you don’t have to scrutinize everything that you read but still, comics are a medium where you can choose your own pace, as opposed to film, so why not taking advantage of this opportunity? Now I even find myself freezing at one panel for a solid minute if it’s compelling or shocking or beautiful enough. The most recent example I can think of is in David Mazzucheli’s “Asterios Polyp”. There’s this splash page that’s bound to make you halt your reading in pure shock. Also, slowing your reading makes easier assimilating and remebering information and characters. So yeah, taking your time while reading can only be at your advantage. Thanks for the comment! You’re right, once you really pay attention, it can be amazing what these artists are doing. I find I’m more compelled to stare when it’s very detailed art, like in A Bride’s Story or Habibi, but then also when the artist is giving her characters a lot of emotion, like in Hicks’s work. It just gives you a better sense of place and character. I’ve seen Asterios Polyp in my library, and I’ve been trying to figure out if it’s something I’d be into. I’ll give it a try and see if I can find that splash page. Fantastic article! I first started reading graphic novels last year, and I ran into that same problem: I read them too fast. In doing this, I really missed out on half of the story (the artwork). I began reading them twice, once to get the story from the words, and the second time focusing on the illustrations. I don’t do this anymore, but for the first few texts, it really helped me get adjusted to the new medium. I also think that reading graphic novels in which the panel layout/illustrations play a large part in the story helps to slow down one’s reading. I’d suggest Night Fisher or even a superhero graphic novel like The Dark Knight Returns. Thanks for the comment! Comics really are different from straight-up text, or even from illustrated books, and sometimes I think it does take a conscious effort to read them correctly. It’s good for you that you picked up on your problem so soon and trained yourself to fix it. Thank you for the suggestions. I’ve been meaning to read The Dark Knight for ages, maybe I’ll take this as my excuse to finally pick it up. I don’t read graphic novels, but do read a comic now and then, and have no such problem.